Although I am very new to blogging, I created and have been managing a family website which has served as a personal blog except for the lack of interaction, which is why I’m attempting a regular blog. 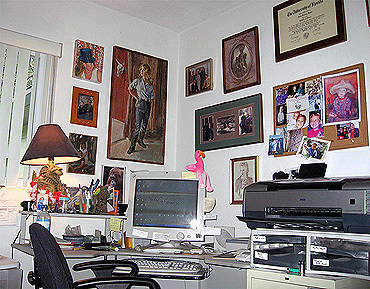 My workspace also doubles as a small guest room and serves as a display venue for my mother’s portraits and family photos. I had one of those flamingos! (sp?) Kept it around my desk for years!